In the 1990s the World Bank changed its policy to take the position that the problems of poverty and governance are inextricably linked, and improving the governance of its borrower countries became increasingly accepted as a legitimate and important part of the World Bank’s development activities. This book examines why the World Bank came to see good governance as important and evaluate what the World Bank is doing to improve the governance of its borrower countries. David Williams examines changing World Bank policy since the late 1970s to show how a concern with good governance grew out of the problems the World Bank was experiencing with structural adjustment lending, particularly in Sub-Saharan Africa. The book provides an account of the early years of the World Bank and traces the increasing acceptance of the idea of good governance within the Bank through the 1990s, while systematically relating the policies of good governance to liberalism. The author provides a detailed case study of World Bank lending to Ghana to demonstrate what the attempt to improve ‘governance’ looks like in practice. 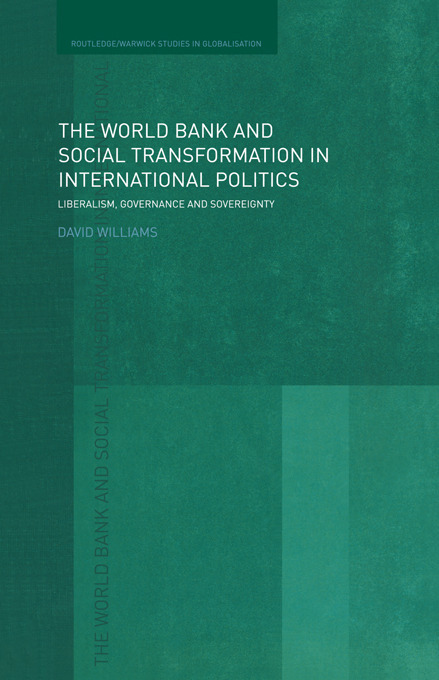 Williams assesses whether the World Bank has been successful in its attempts to improve governance, and draws out some of the implications of the argument for how we should think about sovereignty, for how we should understand the connections between liberalism and international politics. This book will be of interest to students and scholars of international relations, politics, economics, development and African studies.